Unconventional shoe retailer Zappos is getting a lot of attention for its business model and culture centred on the happiness of its workers. And they are reaping the rewards. In yearly workplace surveys from Fortune Magazine and the like. Zappos has been consistently rated as one of the top companies to work for. They have also excelled in the traditional business metrics. It took Zappos under 10 years to reach $1bn in annual revenue. They were acquired by Amazon in 2009 for a sizeable $1.2bn. There is a powerful lesson here. Like Zappos, by putting the happiness and well-being of your staff on centre stage, companies can build a happy culture that is healthy for profits and growth. Zappos isn’t an isolated case. One study found that even a modest increase in happiness at work grew the bottom line by 20%. In another study, the happiest companies were reported to be three times as profitable as regular businesses. This is according to Alexander Kjerulf, founder of Woohoo inc and a leading expert on workplace happiness. Happy employees are more productive. Research demonstrates that happy staff boost the bottom line. This is according to Andrew Oswald, professor of economics at the University of Warwick. He has earned the nickname “the Professor of Happiness” because of his research in this field. Oswald’s studies reported a 12% rise in productivity in happier research subjects. Further support for this comes from Sheffield University’s Institute of Work Psychology in the UK in the 1990’s. Their research, which involved senior managers and 5,000-plus staff in 110 companies over a seven-year period, established that job satisfaction is responsible for as much as 25% of the variation in productivity. However, we don’t yet understand the reasons for this. Happier employees have greater job satisfaction and are less likely to quit. This translates into reduced staff turnover and reduced hiring costs. Why? Think of the opposite situation: it is very costly to hire new staff after their unhappy predecessors have quit their jobs. Not surprisingly, the traditional reason why many companies focused on employee job satisfaction was to reduce churn and hiring costs. And this was even when business thinking dismissed happiness as just a warm and fuzzy idea. Improving workplace happiness helps companies to attract and keep talent. In the wake of the global financial crisis, many businesses have had to significantly downsize. This means they need to do more with fewer resources. So one of their key challenges is to attract and retain their A-players. There is a growing body of evidence to show that improving well-being in the workplace is one way to make this happen. In their “Causal Impact of Employee Work Perceptions on the Bottom Line of Organizations” study, Gallup researcher James K. Harter and his associates found that the work views of staff were directly linked to companies’ customer loyalty, retention of staff, sales and profit. Many managers think holidays, bonuses and raises are what make workers happiest. However, research shows this is not the case. According to the Gallup Business Journal, engagement is a key driver of happiness. Why? Firstly, engaged employees are substantially happier than disengaged ones. Secondly, an engaging workplace plays a more vital role than any company policy in shaping the happiness of its workers. Gallup asserts that engaged workers “drive innovation and move the company forward.” So, without these engaged staff, organisations stagnate and stumble. Happiness increases as countries’ GDP grows, according to Oswald and other researchers. So there is an economic incentive for making people happier. (But only up to a point. In all countries investigated, above a certain level, personal happiness flattens out after GDP continues to rise). But doesn’t money itself make people happy? Yes, it is part of the equation, but only one small part, says Oswald. Based on the research findings of social scientists worldwide, if you go above a yearly per capita income corresponding to $10,000 in purchasing power parity, it is non-monetary factors that determine happiness. For all levels of wealth beyond this range, the support of your family, friends and community, a meaningful role in life, and basic freedoms all play a much more important part. Interestingly, people who eat a healthy diet with lots of fruit and vegetables, tend to be happier. This is one of Oswald’s latest research findings. Giving your workers healthy food choices not only improves their physical health, but also their mental well-being. So there is something to be said for companies like Mondi’s South African forests division that serves nutritionist-prepared daily meals with fruit and vegetables to their field workers. Giving staff opportunities to grow and develop. According to Sainsbury’s annual attitude survey on 133,000 employees, opportunities for learning and development were what employees valued the most in their working environments. In the words of Franklin D. Roosevelt: “Happiness lies in the joy of achievement and the thrill of creative effort.” “Employees should have a sense of control and progress in their careers”, says Zappos CEO Tony Hsieh. To replace the traditional, generic job description, Zappos created a cluster of skills for their call centre reps. Staff directly control their pay raises because they attain the skills that interest them at their own speed, instead of waiting for fixed review periods or yearly increases. Good communication. Your workers want to be kept informed about what is happening in the organisation, especially if it affects their future. The days of “No comment” are dead. Don’t hide the bad news from them. This only breeds distrust and insecurity. It is always better to hear it from the company’s leaders first, before you read about it in the public domain. The key is to take responsibility and to show your staff what you as the leaders of the company are doing to address the issues. To paraphrase Cyndi Lauper, we all “just want to have fun”. So why not have fun at work? Injecting humour and a sense of fun into the workplace goes a long way towards making staff happier. This is a big part of the success of companies like Google and Zappos. 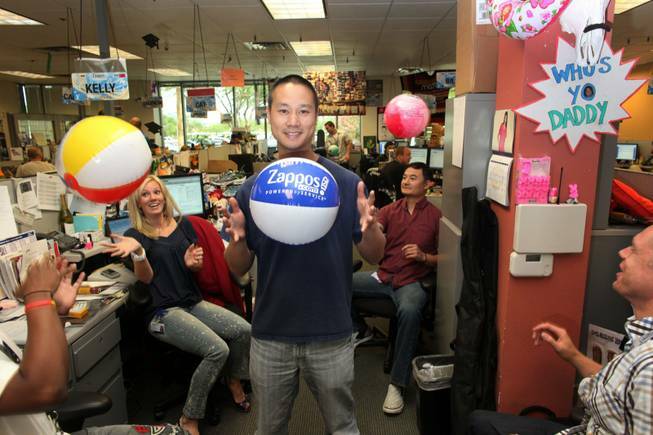 Zappos motivates workers to “create fun and a little weirdness” at work. Laughter is also a powerful stress reliever. Locally we’ve seen a surge in the number of laughter workshops on offer for corporates. (However the jury is still divided as to whether this really works or whether workshops for laughter are unnatural and forced). Having more socially skilled and engaged managers. Having flexible working conditions that allow workers to balance their home and work commitments. This also means doing away with the cultures of long working hours that prevailed in many companies until not so long ago. Employees value support from their companies with all the day-to-day challenges of domestic life. Many businesses now provide workplace crèches, dry-cleaning, laundry, banking and in-house hairdressing to help workers manage their personal lives. Giving people more freedom and autonomy in their jobs. For many entrepreneurial types, this freedom is a key reason why they choose to have their own businesses rather than work in a corporate environment, despite the risk of lower pay (initially) and less job security. This freedom is priceless, say many entrepreneurs. Ultimately building an environment of trust. Clearly, happiness has earned its place in the boardroom, and companies have a compelling incentive to ensure their workers are happy. Gone are the days when happiness and well-being in the workplace were fluffy, feel-good concepts. Today, there is overwhelming evidence to show that happiness directly impacts the bottom line and builds a more productive, engaged workforce. Categories: Business, Entrepreneurship, Leadership, Management | Tags: customers, fun, happiness, healthy, Loyalty, money, productivity, talent, tony hsieh, zappos | Permalink. Great article, I have experienced almost all of these elements over the past 3 years as a GM/MD. on. I want to encourage you to definitely continue your great posts, have a nice afternoon! future. Many other people might be benefited from your writing. user friendliness and visual appearance. I must say you’ve done a fantastic job with this. Hi there, I discovered your site by means of Google while searching for a comparable matter, your web site got here up, it looks good. this in future. Many other folks will be benefited out of your writing. Thanks everyone for the positive feedback. In answer to your questions, this blog is a free WordPress theme, hosted with Hostgator. content as you probably did, the internet will be a lot more helpful than ever before. from you. That is really a terrific site.